Citation Information: J Clin Invest. 2007. https://doi.org/10.1172/JCI31841. Milk fat globule–EGF factor 8 (MFG-E8)/lactadherin participates in several cell surface–mediated regulatory events. Although its mRNA is present in the gut, the physiological roles of MFG-E8 in the intestinal mucosa have not been explored. Here we show that MFG-E8 was expressed in intestinal lamina propria macrophages from mice. Using a wound-healing assay, MFG-E8 was shown to promote the migration of intestinal epithelial cells through a PKCε-dependent mechanism. MFG-E8 bound to phosphatidylserine and triggered reorientation of the actin cytoskeleton in intestinal epithelial cells at the wound edge. Depleting MFG-E8 in mice by administration of anti–MFG-E8 antibody or targeted deletion of the MFG-E8 gene resulted in a slowing of enterocyte migration along the crypt-villus axis and focal mucosal injury. Moreover, in septic mice, intestinal MFG-E8 expression was downregulated, which correlated with intestinal injury, interrupted enterocyte migration, and impaired restitution. Treatment with recombinant MFG-E8 restored enterocyte migration, whereas deletion of MFG-E8 impeded mucosal healing in mice with sepsis. These results suggest that a decrease in intestinal MFG-E8 impairs intestinal mucosal repair in sepsis. Together, our data indicate that MFG-E8 plays an important role in the maintenance of intestinal epithelial homeostasis and the promotion of mucosal healing and suggest that recombinant MFG-E8 may be beneficial for the treatment of bowel injuries. Citation Information: J Clin Invest. 2007;117(7):1951-1960. https://doi.org/10.1172/JCI31027. Endothelial protein C receptor (EPCR) and thrombomodulin (TM) are expressed at high levels in the resting microvasculature and convert protein C (PC) into its activated form, which is a potent anticoagulant and antiinflammatory molecule. Here we provide evidence that in Crohn disease (CD) and ulcerative colitis (UC), the 2 major forms of inflammatory bowel disease (IBD), there was loss of expression of endothelial EPCR and TM, which in turns caused impairment of PC activation by the inflamed mucosal microvasculature. In isolated human intestinal endothelial cells, administration of recombinant activated PC had a potent antiinflammatory effect, as demonstrated by downregulated cytokine-dependent cell adhesion molecule expression and chemokine production as well as inhibited leukocyte adhesion. In vivo, administration of activated PC was therapeutically effective in ameliorating experimental colitis as evidenced by reduced weight loss, disease activity index, and histological colitis scores as well as inhibited leukocyte adhesion to the inflamed intestinal vessels. The results suggest that the PC pathway represents a new system crucially involved in governing intestinal homeostasis mediated by the mucosal microvasculature. 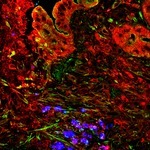 Restoring the PC pathway may represent a new therapeutic approach to suppress intestinal inflammation in IBD. Citation Information: J Clin Invest. 2006;116(12):3195-3203. https://doi.org/10.1172/JCI28804. Enhanced NF-κB activity is involved in the pathology of both forms of inflammatory bowel disease (IBD), Crohn disease (CD) and ulcerative colitis (UC). Here we analyzed the mechanism of proteasome-mediated NF-κB activation in CD and UC. Our studies demonstrate that the subunit composition and the proteolytic function of proteasomes differ between UC and CD. High expression of the immunoproteasome subunits β1i and β2i is characteristic of the inflamed mucosa of CD. In line with this, we found enhanced processing of NF-κB precursor p105 and degradation of inhibitor of NF-κB, IκBα, by immunoproteasomes isolated from the mucosa of CD patients. In comparison with healthy controls and CD patients, UC patients exhibited an intermediate phenotype regarding the proteasome-mediated processing/degradation of NF-κB components. Finally, increased expression of the NF-κB family member c-Rel in the inflamed mucosa of CD patients suggests that p50/c-Rel is important for IFN-γ–mediated induction of immunoproteasomes via IL-12–driven Th1 responses. These findings suggest that distinct proteasome subunits influence the intensity of NF-κB–mediated inflammation in IBD patients. Citation Information: J Clin Invest. 2006;116(10):2682-2694. https://doi.org/10.1172/JCI29218. Acute T cell–mediated diarrhea is associated with increased mucosal expression of proinflammatory cytokines, including the TNF superfamily members TNF and LIGHT. While we have previously shown that epithelial barrier dysfunction induced by myosin light chain kinase (MLCK) is required for the development of diarrhea, MLCK inhibition does not completely restore water absorption. In contrast, although TNF-neutralizing antibodies completely restore water absorption after systemic T cell activation, barrier function is only partially corrected. This suggests that, while barrier dysfunction is critical, other processes must be involved in T cell–mediated diarrhea. To define these processes in vivo, we asked whether individual cytokines might regulate different events in T cell–mediated diarrhea. Both TNF and LIGHT caused MLCK-dependent barrier dysfunction. However, while TNF caused diarrhea, LIGHT enhanced intestinal water absorption. Moreover, TNF, but not LIGHT, inhibited Na+ absorption due to TNF-induced internalization of the brush border Na+/H+ exchanger NHE3. LIGHT did not cause NHE3 internalization. PKCα activation by TNF was responsible for NHE3 internalization, and pharmacological or genetic PKCα inhibition prevented NHE3 internalization, Na+ malabsorption, and diarrhea despite continued barrier dysfunction. These data demonstrate the necessity of coordinated Na+ malabsorption and barrier dysfunction in TNF-induced diarrhea and provide insight into mechanisms of intestinal water transport. Citation Information: J Clin Invest. 2006;116(8):2226-2236. https://doi.org/10.1172/JCI27620. Celiac disease is associated with HLA-DQ2 and, to a lesser extent, HLA-DQ8. Type 1 diabetes is associated with the same DQ molecules in the opposite order and with possible involvement of trans-encoded DQ heterodimers. T cells that are reactive with gluten peptides deamidated by transglutaminase 2 and invariably restricted by DQ2 or DQ8 can be isolated from celiac lesions. We used intestinal T cells from celiac patients to map DQ2 and DQ8 epitopes within 2 representative gluten proteins, α-gliadin AJ133612 and γ-gliadin M36999. For α-gliadin, DQ2- and DQ8-restricted T cells recognized deamidated peptides of 2 separate regions. For γ-gliadin, DQ2- and DQ8-restricted T cells recognized deamidated peptides of the same region. Some γ-gliadin peptides were recognized by T cells in the context of DQ2 or DQ8 when bound in exactly the same registers, but with different requirements for deamidation; deamidation at peptide position 4 (P4) was important for DQ2-restricted T cells, whereas deamidation at P1 and/or P9 was important for DQ8-restricted T cells. Peptides combining the DQ2 and DQ8 signatures could be presented by DQ2, DQ8, and trans-encoded DQ heterodimers. Our findings shed light on the basis for the HLA associations in celiac disease and type 1 diabetes. Citation Information: J Clin Invest. 2006;116(8):2142-2151. https://doi.org/10.1172/JCI27821. The neonatal Fc receptor for IgG (FcRn) plays a major role in regulating host IgG levels and transporting IgG and associated antigens across polarized epithelial barriers. Selective expression of FcRn in the epithelium is shown here to be associated with secretion of IgG into the lumen that allows for defense against an epithelium-associated pathogen (Citrobacter rodentium). This pathway of host resistance to a bacterial pathogen as mediated by FcRn involves retrieval of bacterial antigens from the lumen and initiation of adaptive immune responses in regional lymphoid structures. Epithelial-associated FcRn, through its ability to secrete and absorb IgG, may thus integrate luminal antigen encounters with systemic immune compartments and as such provide essential host defense and immunoregulatory functions at the mucosal surfaces. Citation Information: J Clin Invest. 2004;113(1):106-114. https://doi.org/10.1172/JCI19019. Salivary nitrate from dietary or endogenous sources is reduced to nitrite by oral bacteria. In the acidic stomach, nitrite is further reduced to NO and related compounds, which have potential biological activity. We used an in vivo rat model as a bioassay to test effects of human saliva on gastric mucosal blood flow and mucus thickness. Gastric mucosal blood flow and mucus thickness were measured after topical administration of human saliva in HCl. The saliva was collected either after fasting (low in nitrite) or after ingestion of sodium nitrate (high in nitrite). In additional experiments, saliva was exchanged for sodium nitrite at different doses. Mucosal blood flow was increased after luminal application of nitrite-rich saliva, whereas fasting saliva had no effects. Also, mucus thickness increased in response to nitrite-rich saliva. The effects of nitrite-rich saliva were similar to those of topically applied sodium nitrite. Nitrite-mediated effects were associated with generation of NO and S-nitrosothiols. In addition, pretreatment with an inhibitor of guanylyl cyclase markedly inhibited nitrite-mediated effects on blood flow. We conclude that nitrite-containing human saliva given luminally increases gastric mucosal blood flow and mucus thickness in the rat. These effects are likely mediated through nonenzymatic generation of NO via activation of guanylyl cyclase. This supports a gastroprotective role of salivary nitrate/nitrite.